Arlene Tucker (AT): Hi Jan! I remember you said that you’ve been multitasking quite a lot recently. What are you working on? What are you juggling? Jan Lütjohann (JL): Hello! I’m spending a lot of time in my atelier, working towards several exhibitions. That’s a lot of sawing, dimensioning, shaping and joining pieces of wood. At the same moment there’s also a lot of planning and decision making. So I’m juggling with these two modes of working. The methods and hand tools that I’m using are from a time when perhaps time itself wasn’t fragmented in the same way as it is now. AT: Do you ever saw first before making a plan? Have you ever sawed a plan together? Liking this dimensioning idea too! It also sounds like it could be an emotion. Feeling a bit dimensional today. How would that feel for you? How would you get yourself into a state of dimensional? JL: Yeah, I often work based on the scale of a certain piece of wood, a bodily proportion or an architectural limitation. Quite often I can do without mm/cm/m measurements. There is a vernacular geometry that’s based on using the dimensions of one piece of wood to determine the size of another part, or using dividers to transfer, half or multiply without actually ever using measurements. Making a plan in these cases doesn’t mean drawing, but rather like anticipating different outcomes of a process and thinking on the material. A lot of the things I am fascinated with were probably not developed on paper. Funny how you enjoy the idea of dimensioning! In reality, it can be a monotonous affair. A tree is shaped by its metabolism and the weather, and when it’s cut and turned into wood the shapes are quite irregular and complex. In this case, dimensioning means to impose our geometry of straight lines, ninety degrees and other ideas of flatness to the wood. Simply speaking, wood is twisted and bent and full of knots, and if I need a piece that’s 10x10x200 cm, straight with parallel sides, I have to dimension it. All the measurements and relations and so on have to be made. A drawing would be mathematical, abstract and precise, but in hand-dimensioned wood everything is an approximation. Not only does the wood keep bending and changing with the humidity, also the studio floor is uneven, the wooden workbench isn’t only out of flat but also slightly twisted, the measuring tools are only somewhat straight … and so on! So when you mention “feeling dimensional” perhaps that describes the state of mind when I’m looking at a half dozen somewhat precise pieces of wood, thinking of how to compromise different imperfect shapes to approximate something that comes together well. 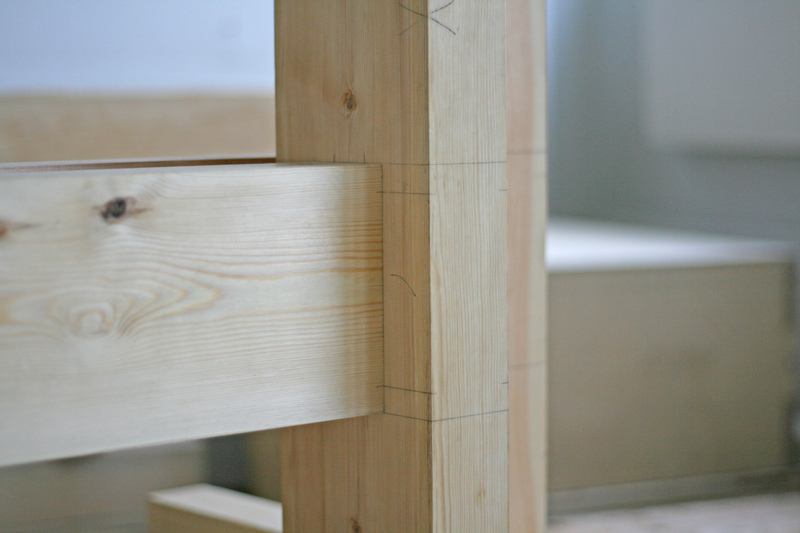 Dimensioning wood with hand tools is either a tiring chore or a profound act. AT: My friend just turned 40 and he made a list of advice he would give to his 17 year old self. What would be on your list? JL: If I could give advice to my 17 year old self I would probably try to convey some of the compound knowledge I have developed through my work since then. I guess this idea of sending back wisdom into the past goes against my understanding of teaching and learning – most of the experience that I would be tempted to transfer to my younger self is what I have since then made in countless hours of working, researching and talking with people. So I am neither sure whether the value of that advice could be recognized, or whether 17-year old me would take advice in the first place… Perhaps I would try something along the lines of: Throw that smooth desk out, get a wooden workbench and don’t be afraid to wear it out. Use the internet to research material that is not in your native language and not in English, either. Buy wood directly from the sawmill and learn how to rip it lengthwise. Go around the villages and learn things from the farmers and retired workpeople before they die, they are happy to share. And so on. AT: I agree. Somehow the idea of apprenticeship and keeping the barter system active has always been idealized in my head, but I still use these on a practical level because they work really well! How do you feel about the idea of NOT making things personal? I guess for me, everything is personal, everything is emotional. How can you separate that? I’m asking because I’d like to learn or understand how to create better boundaries. JL: For me that separation between personal and common is an important device to maintain a critical distance to my work. I’m trying to distinguish between my personal curiosity and something that is common or relates to collective experience. It's one of the reasons why I’m drawn to tools and equipment because there are shapes and inventions that reoccur during different times and places throughout human history, where similar needs, material constraints, bodily proportions have brought forth similar solutions. They are a constant of human life. This collective process of trial and error, shaping and differentiation is really fascinating, and so is participating in it. So in terms of emotion I would say that it plays a part, but more in the form of fascination, awe, contemplation and the whole range of emotion that is part of manual work. Often, the actual working requires significant concentration. A piece of wood from a tree that has grown for a century and then dried for a few more years can be cut in half only once. Not only that, but there might be no second piece to start over if anything goes wrong! That’s emotional, too, but perhaps it isn’t revealed to everybody. AT: What you said makes a lot of sense even though it is just so opposite from how I function. I like that! Hearing other approaches makes me critically reflect on my believes. Thank you for that! Do you ever feel burdened or inhibited by your idea that, “there might be no second piece to start over if anything goes wrong!”? JL: Yes. It can be inhibiting in an environment that values output, speed and volume. It would be a burden only if I were forced to work with a specific material by some fateful turn, but since it’s my choice its more like a responsibility. Sawing or shaping an old piece of wood, from an old tree that has grown for several human generations, isn’t that intimidating? Should I do that? It’s not that I work with especially ancient material, it’s just that even the basic wood from the local shop is awfully cheap considering it’s age and origin. Even if I acquired wood so that it wouldn’t give anyone incentive to cut more, like a gift from an older friend or from recycling, it feels important to use it well. On a more secular scale, this responsibility also has to do with the limitations of my stockpile and time. The material has dried and cured for months or years, and I simply can’t wait for another batch to dry or put in the whole work again. The wood doesn’t care about institutional calendars or deadlines. AT: Is there a piece of art that touches you because it is so personal? JL: Yes. If by personal you mean one that expresses its’ creator’s individual experience overtly, there are probably many even though I can’t think of a specific one at the moment. I remember many artworks or artifacts from anonymous or forgotten makers. What is touching and personal in those is that these works relate to something which I and many others can feel even though we are hundreds of years or thousands of kilometers away from their creators. I see around me that art is often approached as being very intimately tied to the experience of their maker. How is this still such a common habit? I notice how even I have to actively disconnect for example a singer’s natural persona from their the lyrical persona in the singer’s lyrics. It seems regrettable that information about the author is so often used as a key to a work, rather than for example the experience and lives of the viewers. You mention the separation of personal and impersonal - I would be curious to know what you think about artworks or cultural works that are without a known author, or by anonymous? AT: Now that everything is so accessible and open, nothing is private, everything is laden with associations and judgements. You can find out about everybody’s personal life very fast, especially if they are somewhat well known. Anonymity can help, which is probably why some artists have tried to stay anonymous, but that hasn’t always worked out. And then people eat up the stuff that is told to them. For example, this article about ************* (sidenote: Jan decided to leave this recluse anonymous as to make the point more relevant), who was a famous recluse, has so much private detailed information that it is hard for me to believe, but still I’ll keep it in the back of my mind as it could be true. And for some of it, I really don’t want it to be true because I love his books! I remember as a teenager I would get really heartbroken when I would fall in love with artists only to realize later that they were womanizers and had cheated on their wives. I was really crushed by this. As a kid I read a lot of biographies because I loved reading about the person, not just about the art that they were making. Those stories did make a huge impression on me. Is this fair? I’m not sure. Later on, and even now, I try to separate that. I don’t believe that one’s work totally encompass or identifies who they are and vice versa. No matter how public things are, nobody can get into our minds. Definitely, an author/writer/reporter can portray and paint a picture that works to their favour or perspective and that can be quite dangerous. So, we must do our research! I have been exchanging letters with an artist’s wife because the husband, the artist, is in prison. She told me that after her husband’s conviction people stopped buying his work and his worth has be devalued. When I’ve talked about this with people they start telling me, well, it depends on the crime he committed and so on. I am not really sure how I feel about this except that I have tried to learn to separate personal from public. Being anonymous might alleviate all of that. Then it’s really just about the work and how it touches you. Does that make any sense at all? How do you feel about knowing the backstory of a person? JL: Sometimes it’s enjoyable to know the background of a writer or artist, but often I’m quite satisfied with the nebulous persona that is created through my interaction with their work, rather than reading about the actual person. The disappointment you mention where an artist’s personal behavior didn’t live up to your impression of their work is a good example. Perhaps artworks are artworks and people are people. On the other hand, when the life of an artist becomes a kind of story itself, or a sort hagiography, it adds a layer of myth and storytelling to the work itself. I like that! In the case of many African American blues musicians from the early 20th century for example, knowing these retellings of their lives helped me appreciate their music and lyrics even more. Interesting that you bring up *************, whose famous reclusiveness is like a strong and curious footnote to his writing. Even more so since he helped introduce to a broad audience the idea that a reader cannot fully trust the narrator of a story. Perhaps as a famously reclusive author he is a an extreme example for the absurdity of being an hermit among people. AT: I feel that in the end, making boundaries for oneself is the key to feeling OK within and out of comfort zones. Boundaries also refer to how somebody’s opinion or action touches you. I say that to myself because in a way it touches control issues, which I definitely try to confront and learn how to deal with. I feel that when meeting new people or being in new situations, that’s when you get really test yourself and your boundaries. With that said, what are three questions you would like to ask somebody? This somebody could be anybody of your choice and you don’t need to reveal who they are. JL: I sometimes ask how people would like their everyday life to be if everything went how they wanted it to be, and I don’t think I ever get an answer because that question is really private and relates to their dreams and hopes. So I’m not telling you! Other than that I like to ask people for advice. I would like to interview all sorts of creators, makers and artists from different places and times about their opinions and secrets - even though that would potential spoil my relationship to their work. AT: Secrets. We all have them.